The TCL Chinese Theatres VIP Tour is the only place in Hollywood, where you learn the star-studded history of the historic TCL Chinese Theatres. The Tour features stories and fun facts about the theatre’s Hollywood premieres, celebrities, and its Forecourt of the Stars. 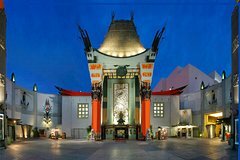 Since 1927, the TCL Chinese Theatre has been home of the star powered red carpet movie premieres, and special events, where Hollywood's biggest and brightest stars have come to watch their movies! The most famous movie theatre in the world is known for its unique Forecourt of the Stars, featuring cement hand and footprints, of major movie stars from past to present. So step off the red carpet and walk through the golden doors of this Movie Palace of the Stars, on our exclusive 30 minute Walking Tour. A visit to Los Angeles is not complete without this stroll through Hollywood movie history. Beginning in the historic Forecourt of the Stars, the guests are escorted inside the world-famous TCL Chinese Theatre. While in the lobby, the VIP Tour Guide takes guests back in time, through Hollywood’s glamorous history. Guests are shown various costumes, props, iconic artwork, and architecture associated with the history of the theatre. After walking through the displays in the lobby, patrons will be escorted to the main theatre, home to the largest IMAX in the world. While seated in the luxurious auditorium, guests are given the opportunity to relive the theatre’s star-studded past, by watching a short film, hosted by TCM’s Ben Mankiewicz. Once the film is complete, the patrons are brought back out to the historic forecourt. While being escorted, the VIP Tour Guide divulges fun facts and secrets about some of the most iconic-cemented hand and footprints, including Marilyn Monroe, John Wayne and Shirley Temple. After experiencing the theatre’s trove of celebrity history, the guests are brought into Grauman’s Gallery. Located in the TCL Chinese 6 Theatres, patrons are shown photographs from some of the most iconic events in the theatre’s past. Also located in the theatre are practice slabs from various hand and footprints ceremonies. With over 80 years of history, the TCL Chinese Theatres remains one of Hollywood’s most beloved movie palaces.